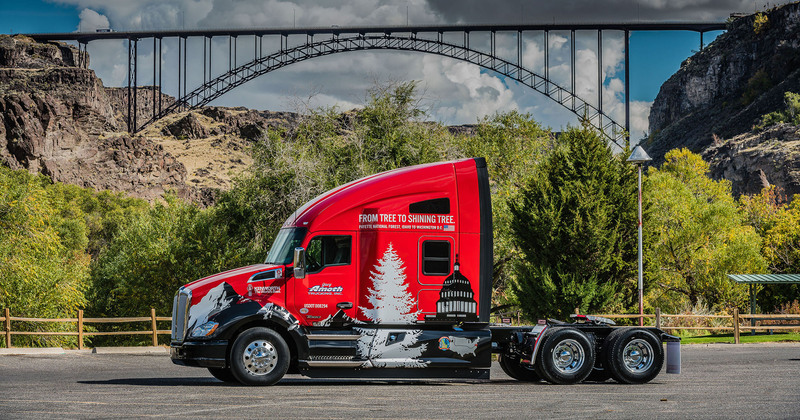 Gary Amoth Trucking is honored to be selected to carry the 52nd US Capitol Christmas Tree from the Payette National Forest to the West lawn of the US Capitol. Gary personally plans to haul “The People’s Tree” along the 4,000 mile, 28 stop trip across the United States. He will be joined along the way by the Idaho Potato Commission’s Big Idaho Potato truck as well as by Chris Niccoli who is responsible for tending the tree. The 80’ Englemann Spruce will be cut on November 2nd and gently placed in a custom built 80’ cradled trailer and then transported to McCall, Idaho to be prepared for its journey. The preparations will include an 80 gallon bladder that will feed the tree 20-40 gallons of water a day. Celebrations will begin on November 5th with a special ceremony in downtown McCall from 5pm-7pm to send off the tree. There are over 18,000 ornaments that were handmade by local Idahoans that will be transported as well and used to decorate the tree. The last time Idaho was chosen to provide the Capitol Christmas was in 2003. It was an Englemann Spruce from the Boise National Forest. We would love to see you at one of our scheduled stops but if not, help us celebrate by following the tree here or on FaceBook. The Tree Has Been Harvested!